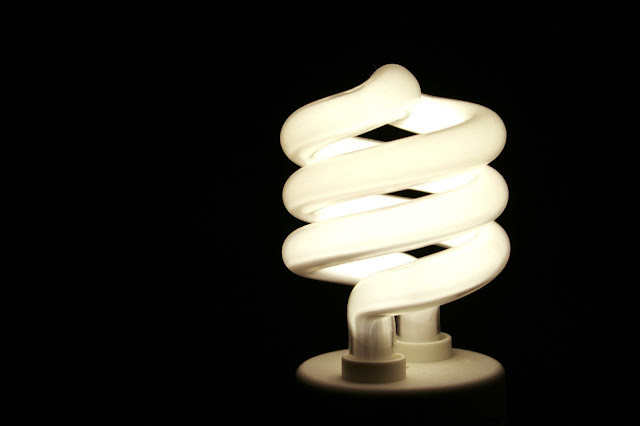 Eye doctors generally believe that astigmatism is mostly inherited and perhaps partly environmentally caused. They also believe that it does not go away and will probably get worse over time. While the aim of the vision-training astigmatism exercise is to eliminate corneal astigmatism by releasing the tension, it is useful to understand the way astigmatism is corrected with glasses, contact lenses or surgery. Sir Isaac Newton, who himself appears to have been astigmatic, first considered this question of astigmatism in 1727. Seventy years later, in 1801, the renowned scientist Thomas Young investigated astigmatism in detail. Young is reported to have had 1.7 diopters astigmatism. It was Cambridge astronomer Airy (1827) who was the first to correct the astigmatism with a cylindrical lens. However, it was the invention of the keratometer by Helmholtz in 1856 and the treaties of Donders in 1864, “Astigmatism and Cylindrical Lenses,” that put astigmatism on the map as something of importance. Early attempts at surgical correction of astigmatism was made by Snellen in 1869. His theories and that of Bates (1891), Luciola (1893) and Dognoff (1895) were confirmed by Lans in 1897. A number of researchers have over the years come up with various theories about what causes astigmatism. The eminent scientist Helmholtz (1906) suggested that due to the anatomical factors, the eyes would be expected to have against-the-rule astigmatism. But this tendency is countered by eyelid pressure, which tends to cause withthe- rule astigmatism. Duke-Elder (1932) suggested that with-the-rule astigmatism was related to the fact that the vertical diameter is slightly larger than the horizontal diameter. Poos (1950, 1952) suggested theta unequal local distribution of blood to the eye might be a cause ofastigmatism. Marian-Amat (1956) wondered of with-the-rule astigmatism in in fats might be due to frequent constriction of the orbicularris muscle, which is associated with crying. Duke_Elder (1970) suggested that lid pressure could cause or alter, corneal astigmatism. Later Vihlen and Wilson (1963) found that both with-the-rule and the elastic coefficient ny lid pressure declined with age, but they found no evidence that corneal torridity was determined by lid tension. Wilson et al. (1982) showed that lid pressure did indeed produce some with-the-rule astigmatism, but generally, lifting the eyelids has littles effect on corneal curvature when astigmatism was between 1.00 Diopter with-the- rule and 1.00 diopter against-the-rule astigmatism. A number of authors including Fairmaid (1959), Lopping and Weale (1965), Bannon (1971) and Milodot and Thibauld (1985 have reported that convergence of the eye is accompanied by a falling of the horizontal corneal meridian, bringing about a slight increase in withthe- rule astigmatism or a decrease in against-the-rule astigmatism. Lopping and Wheale (1965) and Bannon (1971) have estimated that the decrease in power of the horizontal meridian accompanying convergence is from 0.245 to 0.50 diptera in non presbyopic eyes. Hofsteller and Rife (1953) concluded that astigmatism was mostly an environmentally determined trait. Lyle (1965) concluded that no hereditary patterns were discernible for astigmatism under 2 diopters. 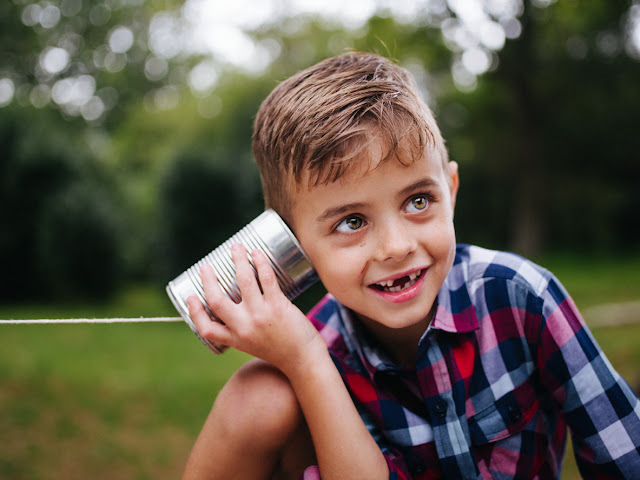 There are growing evidence that astigmatism develop due to environmental influences and personal habit and individual may have adopted as he or she grow up. Depending on the structural rigidity of the cornea, which wars from individual t individual. The corneal tissue is flexible and can be influences by stress patterns caused by unequa muscle tone. Astigmatism that is greater than 0.50 diopters is seen in 44.9% of the population. Roughly 8.4 % of the total population has astigmatism of 1.50 diopters or greater. Generally, 10% of the population can be expected to have astigmatism that is greater that 1.0 diopter (D.L. Gugton, 1977). Astigmatism occurs when there are two focal points: one on the retina and the other either behind or in front of the retina. The difference between these two points causes a blurring or a shadow image.Although astigmatism can have several causes, most of the causes involve corneal astigmatism. 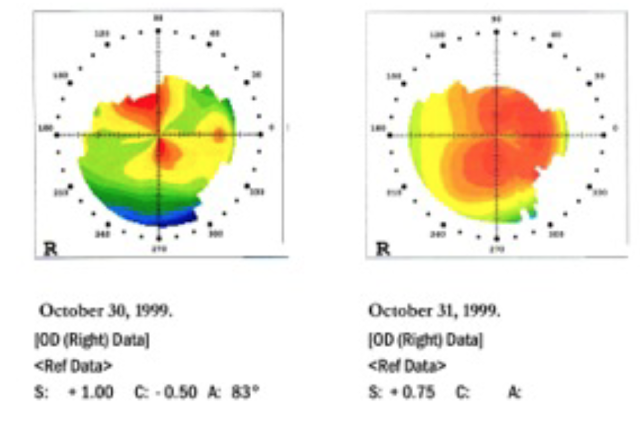 As the name suggests, this is astigmatism in the cornea that is caused by an unequal tension pattern among the four recti muscles in front of the eye.The cornea is normally a perfect dome with an outer curve of approximately 7.8 mm or 48.83 diopters. 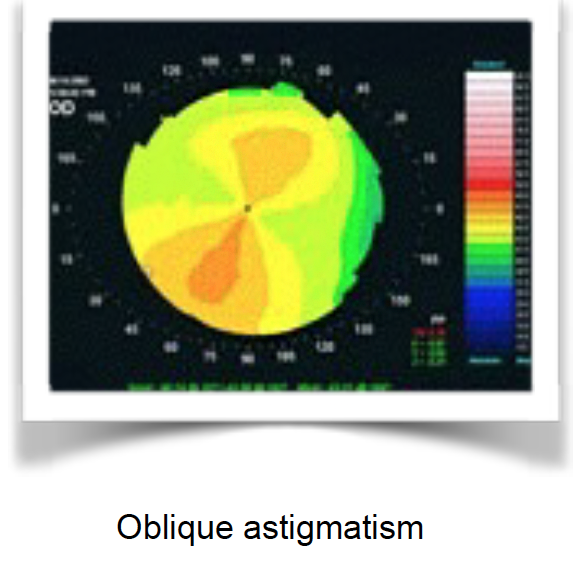 Corneal astigmatism occurs when the vertical and horizontal meridians are not equal. Thinking of a ball as an example, it’s perfectly round and all meridians are equal. If one of the meridians is steeper than the others, light rays would be focused on different spots, one for each meridian. Lenticular astigmatism is similar to corneal astigmatism, except it exists in the lens rather than the cornea. The lens may have variations in its curvature rather than having a perfect curve, causing images tt reach the back of the eye (the retina) imperfectly. Most people with lenticular astigmatism have a normal-shaped cornea and the defect is only in the curvature of the lens. – when light rays focus on two different planes (distances) in the eye. One focal point of the light rays is on the retina and the other focal point is behind the retina. – when both focal points are behind the retina. – when one focal point is in front of the retina and the other one is behind the retina. – when one focal point falls on the retina and the other focal point falls in front of the retina. – when both focal points are focused in front of the retina. Glasses are made with cylindrical elements added at the appropriate axis to compensate for the astigmatism. With glasses, it is easier to keep the cylinders in the right position since you do not move the glasses. However, slight distortions occur when the user alters the line of sight from the exact center of the lens, such as when reading or looking down. – where the vertical meridian is steeper than the horizontal. The vertical meridian is between 60º and 120º. For glasses, the Rx written in minus cylinder form would have an axis of 30º to 180º. To correct the astigmatism, a minus cylinder is placed in the horizontal axis and a plus cylinder is placed in the vertical axis. – when the horizontal meridian is steeper than the vertical. The horizontal meridian is between 0º and 30º. For glasses, the Rx written in minus cylinder form would have an axis between 60º and 120º. To correct the astigmatism, a plus cylinder is added in the horizontal axis and a minus cylinder is added in the vertical axis. – when the steepest meridian is neither vertical nor horizontal. 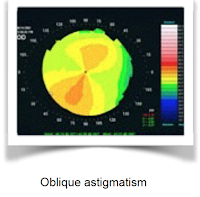 Oblique astigmatism is between 31º and 59º on one side and between 121º and 149º on the other side. For glasses, the Rx written in minus cylinder form would have an axis that is different than 60º to 120º or 30º to 180º. Contact lenses essentially fill in the missing curvature so the eyes of the lens wearer will have equally curved meridians, correcting the astigmatism. Measuring the topography of the eye is done by projecting a series of concentric circles on the eye, with the perfect eye having a series of complete circles. The way the circles deviate shows the topography of the eye. It is similar to how mountains are shown on maps. Different colors indicate the diopter or power at a particular level of the curve. A version of this is performed when you look into the auto-refractor. Depending on the machine, the output will either be a series of measurements or a topographical image showing the exact landscape of the eye. A subjective measurement is done by looking at the familiar astigmatic mirror, which will show the distortions that the astigmatism produces at different angles of view as well as distances. The first column on your prescription indicates the myopia correction needed in diopters. The second column indicates the cylindrical correction needed to correct the astigmatism. The third column indicates the axis of the main meridian and where the cylinder element needs to be positioned. Normally, the second and third columns describe the astigmatism. Spherical Cylinder Axis Left eye -2.00 -1.50 90 Right eye -1.50 -0.50 138. A cylinder is specified by its axis, and the power of a cylinder at its axis meridian is zero. 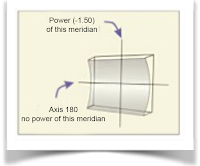 Maximum power is 90° away from the axis, which is also known as the power meridian. 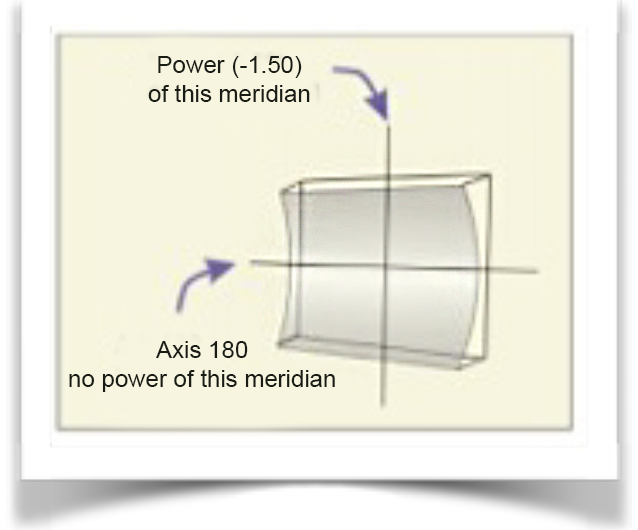 The image formed by the power meridian is a focal line parallel to the axis. There is no line focus image formed by the axis meridian because the axis meridian has no power. A Jackson cross cylinder is a lens with two opposing cylinders. 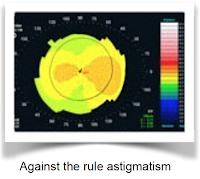 By turning the cross cylinder at an angle or axis, the astigmatism can be altered until the client can see reasonably well. With the axis known, the power of the cylinder can be increased or decreased until the client perceives no difference, at which point the trial lens is correct. 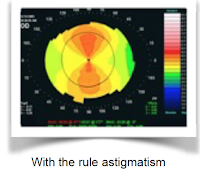 No laser equipment is approved for surgically correcting astigmatism. The laser is set to remove tissue in the line of astigmatism to reshape the cornea for a more spherical curve. Since the cornea is only about half a millimetre thick, the reshaping that is possible is probably minimal. Also, any surgery presupposes that your eyes stay the same for the rest of your life. Lens implants are mostly in association with cataract surgery, but it is also promoted as a correction for myopia. If left uncorrected, even minimal astigmatism can compromise the visual results of these lenses after cataract surgery. Significant astigmatism after cataract extraction surgery is quite common. Astigmatism greater than 1.0 diopter is very common, with astigmatism greater than 3.0 diopters occurring in as many as 20% of cases (N.S. Jaffe, 1975). High astigmatism after penetrating keratoplasty is even more common (Troutman, 1987, p. 286). 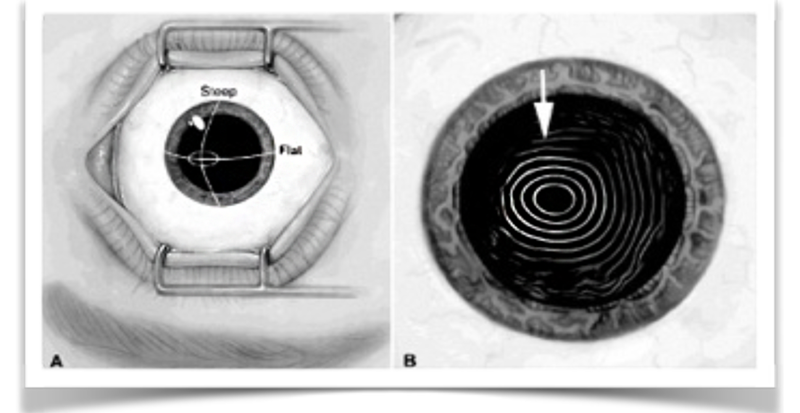 Any invasion(s) in corneal tissue that interrupt Bowman’s layer will induce a permanent change in corneal curvature. The more numerous, longer, or deeper the incisions, the greater the curvature change induced. This is the theoretical basis for micro surgery such as Radial Keratototmy (RK) and Astigmatism Kertatotomy (AK). Radial Keratotomy is used in many cases to release the tension held in the cornea. Incisional Astigmatism Keratotomy or Limbal Relaxation Incision was suggested in 1894 by W. H. Bates, M.D. Bates suggested that incisions of the cornea made at right angles to the steeper meridian might be used to correct astigmatism. In his doctoral thesis, Dutch ophthalmologist L.J. Lans (1898) showed that flattening the meridian perpendicular to a transverse incision was associated with steepening in the opposite meridian. He also showed that deeper and longer incisions had a greater effect and that placing incisions closer together made more flattening possible in the steep meridian. 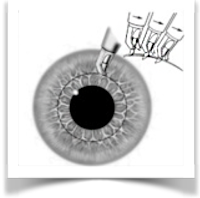 Limbal Relaxation Incisions are said to achieve a 79% reduction of astigmatism corrected to less than 1.0 diopter. This, however, still causes visual distortions such as shadows behind letters when reading. Vision training exercises are based on the assumption that the various corneal astigmatism types are mainly due to an uneven tension pattern held among the four recti muscles around the eye. Therefore, exercises were designed to release the muscle tension actually causing the astigmatism. This is similar to the principles applied to Incisional Astigmatism Keratotomy, where the wound gap is in effect releasing the tension. When the astigmatism exercise (the Tibetan wheel) is done correctly, the effect is immediately visible on the astigmatic mirror chart and on the topographical images, as seen below. The images were done one day apart. The vision training approach has no known adverse effects except for sore muscles if done too aggressively. I have used this exercise for more than 20 years successfully with lasting results. This is vision training with results you can actually see.